This run is an exploration of Riga’s west bank highlights, packing a lot of scenery, sights, and variety into a 12.5 km route. We start in central Riga, crossing the Vanšu Bridge to the west bank. The first section is a tour of the island of Ķīpsala, an oasis of green and pretty homes bisecting the river and the Zundis canal. 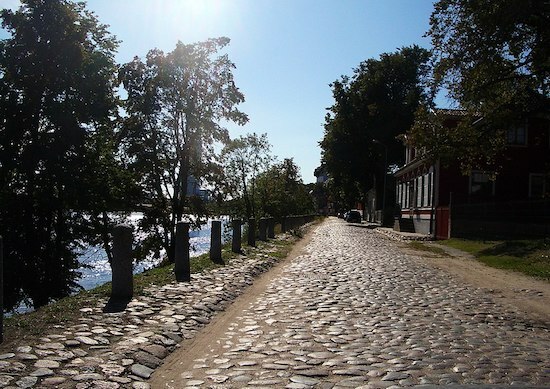 Balasta dambis is a lovely, cobblestone path along the river. Loop back along the canal path. Cross Krišjāņa Valdemāra iela over to Victory Park, built to commemorate the Soviet victory over Germany, and do a loop around its wide paths and gardens. Add another ~1 km loop around Arcadia Park. Use the pleasant Ojāra Vācieša iela, a tree-lined dirt road, to get to the road that leads to the Akmens Bridge, and enjoy the riverside path from the National Library to AB Dam, then crossing back over to the east side. Options: The run can be shortened by eliminating some sections, such as the park or loop to AB Dam, or by starting on the west side.